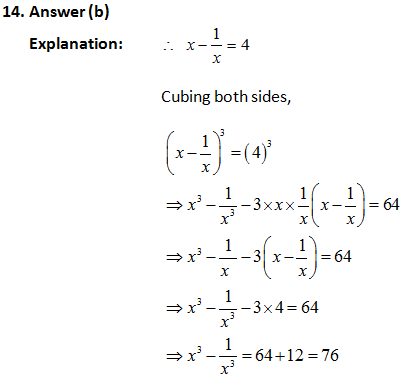 we have designed mock papers which will test your mathematical skills. 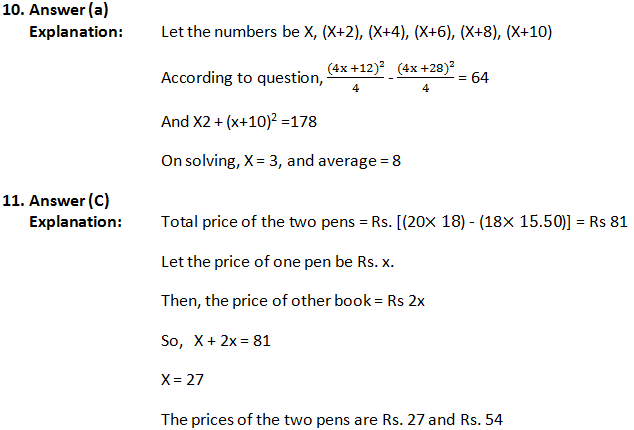 So, let’s start the practice with the 1st Quantitative Aptitude Mock Test. 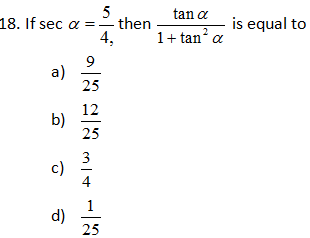 You must try to finish all the 25 questions within 25 minutes time duration. 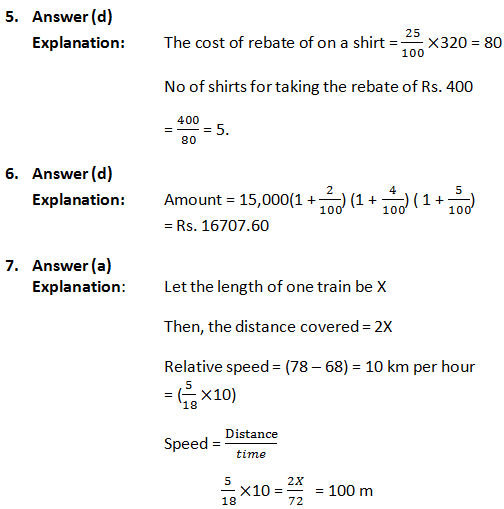 After attempting all the questions, you can assess your performance by checking answers alongwith their solutions given latter in this article. 1. Sonal bought a box of chocolates to distribute them on her birthday in school. The box weighed 600 grams at the time of purchase. She distributed 3/4 th of the chocolates and now, the weight of the box is 240 grams. Find the weight of the empty box? 2. Five bells commence tolling together and toll at intervals of 3,6,9,12 and 15 seconds respectively. In 30 minutes, how many times do they toll together? 3. 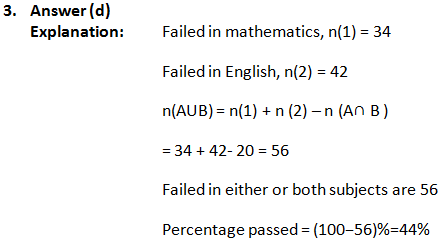 In an examination, 34% of the students failed in mathematics and 42% failed in English. If 20% of the students failed in both the subjects, then find the percentage of students who passed in both the subjects. 5. A merchant has announced 25% rebate on prices of ready- made garments at the time of sale. If a purchase need to have a rebate of Rs. 400/-, then how many shirts, each costing Rs. 320/-, should he purchase? 9. 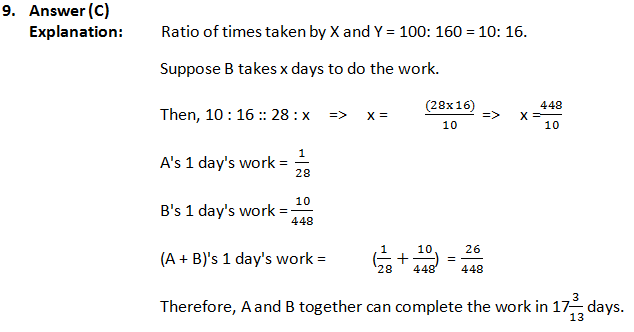 A is 60% more efficient than B. How much time will they, working together, take to complete a job which A alone could have done in 28 days? 11. The average price of 20 is Rs. 18 while the average price of 18 of this pen is Rs. 15.50. Of the remaining two pens, if the price of one pen is double the price of the other, what is the price of each of these two pens? 12. In a group of four friends, Ram and shyam have equal weight .The ratio of weight of shyam and Pooja is 2: 3 and the ratio of weights of Ram and Neenu is 1: 2. If the average weight is 55 kgs. How many of them have weight equal to or greater than 60 kgs. 13. 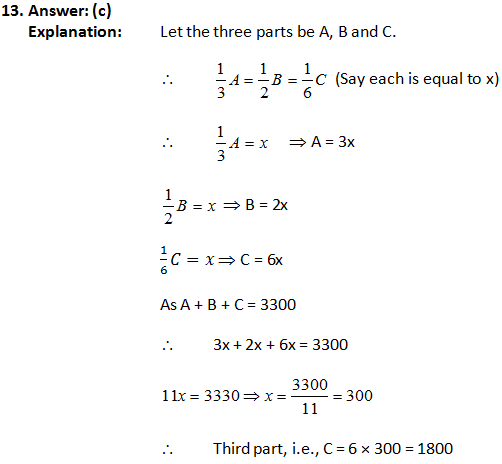 What is the third part if we divide 3300 into three parts in such that one third of the first part, half of the second part and one sixth of the third parts are equal? 15. P and Q are two alloys of Aluminium and Zinc prepared by mixing the respective metals in the ratio of 5:3 and 5:11 respectively. 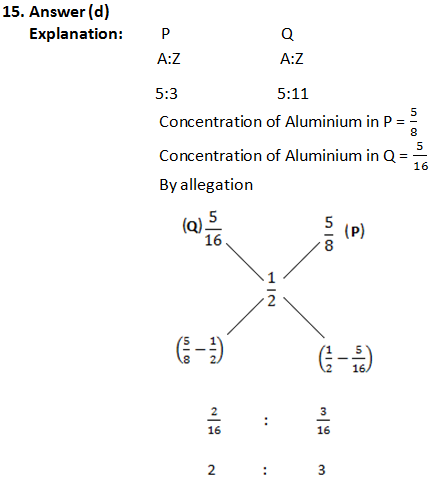 If the alloys P and Q are mixed to form a third alloy R with an equal proportion of Aluminium and Zinc, what is the ratio of alloys P and Q in the new alloy R? 17. Find the length of the perpendicular from the point (3, – 2) to the straight line 12x – 5y + 6 = 0? 20. The circumference of the base of a circular cylinder is 12π cm. The height of the cylinder is equal to the diameter of the base. How many litres of water can it hold? 21. Directions (21-25): The following table shows the number of new employees added to different categories of employees in a company and also the number of employees from these categories that left the company every year since the foundation of the Company in 2000. 21. What is the difference between the total number of Scale 1 added to the Company and the total number of Human resource added to the Company during the years 2001 to 2005? 22. What is the total number of employees working in marketing department of the Company in 2004? 23. What is the percentage increase in the number of employees working in Scale 2 of the Company from 2000 to 2005? 24. What is the approximate average of the total number of employees of all categories in the year 2001? 25. During the period between 2003 to 2005 the total number of scale 2 who left the Company is what percent of total number of scale 3 who joined the Company in the same period? The difficulty level of the above mock test was ranging between easy to difficult level and a good score would lie between 17 to 20 marks. Don’t stop your practice until you achieve efficiency and accuracy. 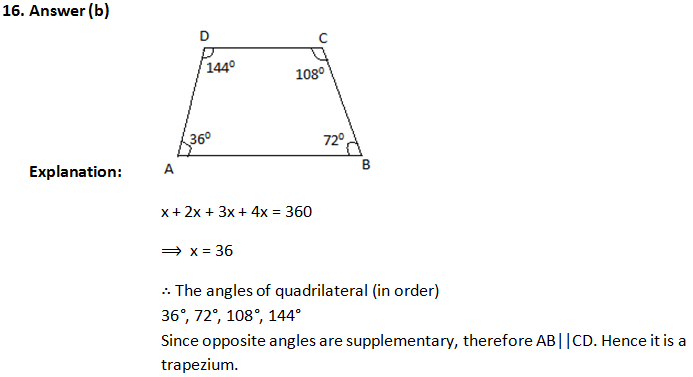 Try another mock test here – Quantitative Aptitude Mock Test.